Fridays are for couscous. And it seems every Moroccan follows this tradition. Mokhtar’s sister and her family were kind enough to invite me over to enjoy it with them! 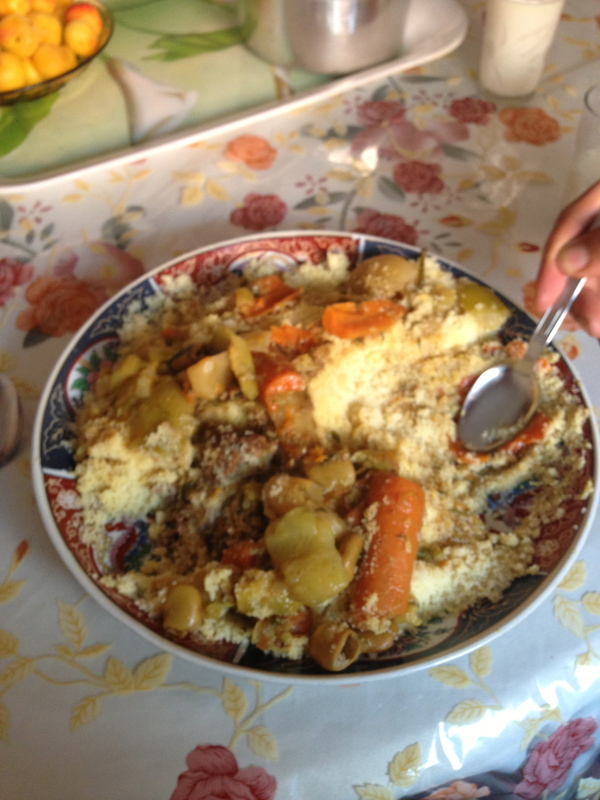 It was the best couscous I’ve ever had. Amazing! It had kind of a spice to it and she served fresh hot peppers with it besides. She will give me the recipe and allow me to make it with her next week when I return to their home. It was great spending time with these family members! Four children aged 16, 12, 7, and 2. Lots of energy and joy in that home! And such love. It was really a great time. The home is beautiful, which is always fun to see, but it was comfortable and they are wonderful hosts. I slept on the Moroccan sofas in the living room with the 12 year old daughter and it was an excellent nights’ sleep with donkey hooves sounding down the street in the night, cats fighting, birds singing, and all kinds of other Moroccan city sounds! And then the call to prayer which always first wakes me, then lulls me back to a deep sleep. Ah, Morocco!